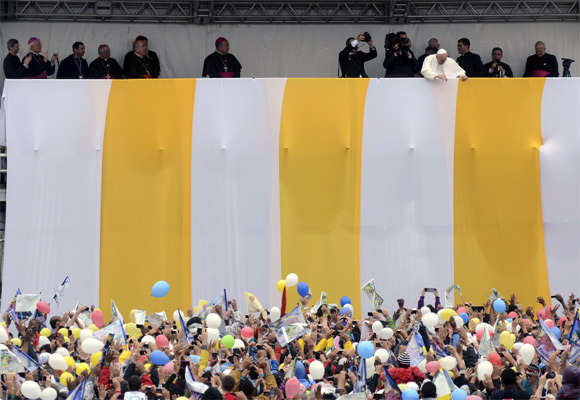 Pope Francis, who is on a weeklong visit to Brazil, arrived in the largest Latin American country on Monday, which coincided with the World Youth Day. 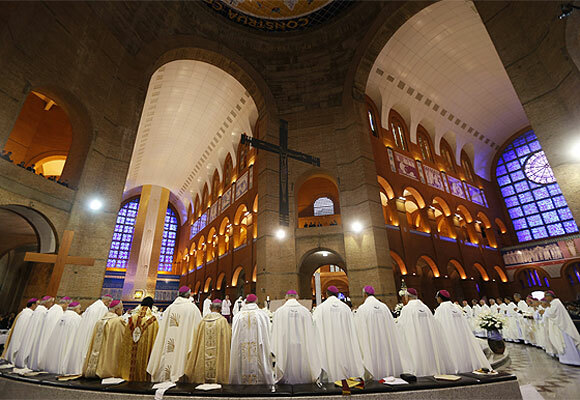 The event drew some 1.5 million young Catholics from 170 nations. The Pope on Thursday called on the rich to wipe out vast inequalities, and later received an ecstatic welcome from up to a million people on Rio's famed Copacabana beach. During his first mass in Brazil, the Pope urged Catholics to resist the “ephemeral idols” of money, power, success and pleasure. 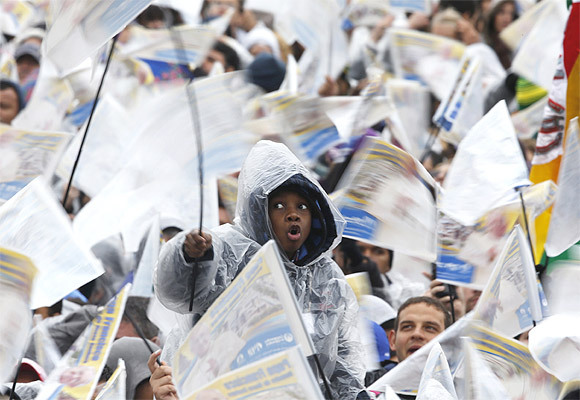 Despite downpours and chilly weather, thousands of jubilant Brazilians and foreign visitors turned out to welcome the pope. The crowd at Copacabana was estimated at up to 1 million. 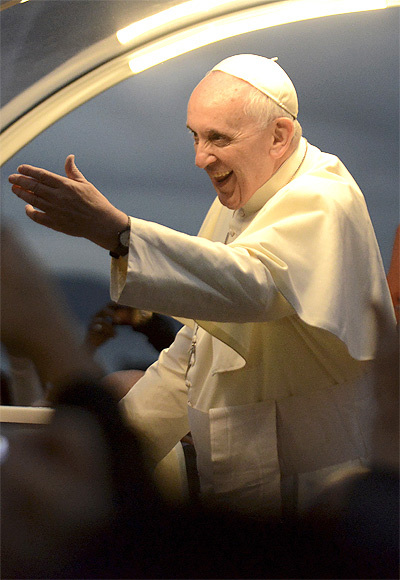 Take a look at images from Pope Francis’ first foreign trip as pontiff. 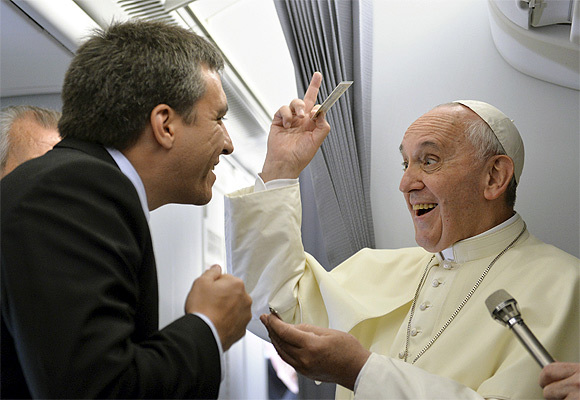 Pope Francis laughs while speaking to journalists travelling on the papal flight to Rio de Janeiro. 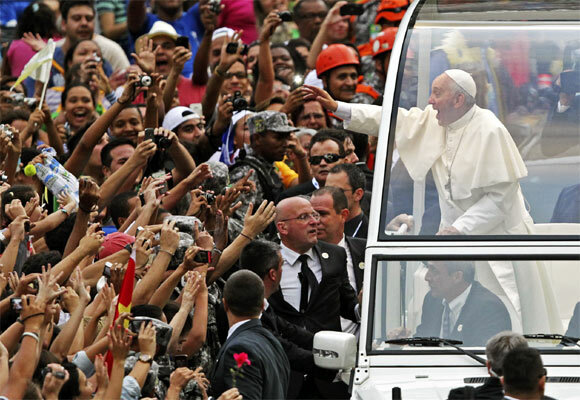 Pope Francis greets the crowd of faithful from his popemobile in downtown Rio de Janeiro. 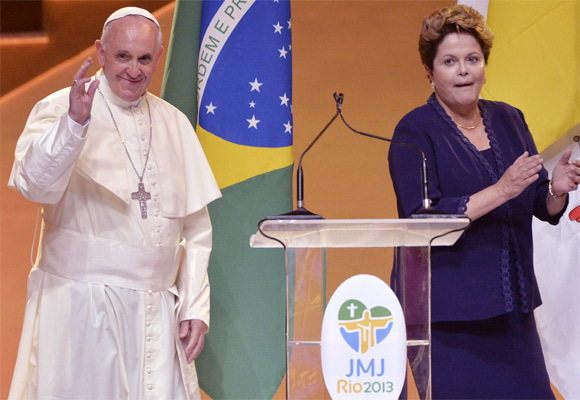 Francis and Brazillian President Dilma Rousseff attend a welcoming ceremony for the Pope in Guanabara Palace in Rio de Janeiro. 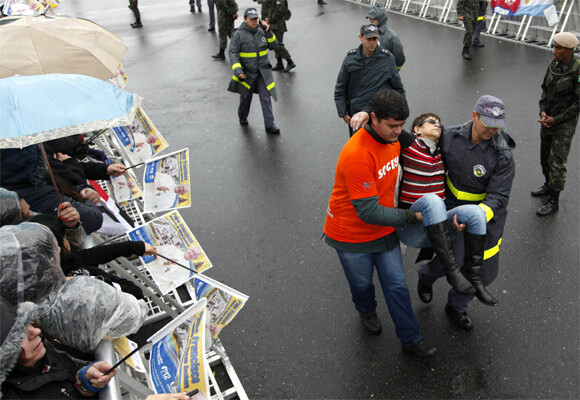 Rescue workers help a faithful who fainted while awaiting Pope Francis at the shrine of the Madonna of Aparecida, who Catholics venerate as the patroness of Brazil, in Aparecida do Norte, Sao Paulo State. 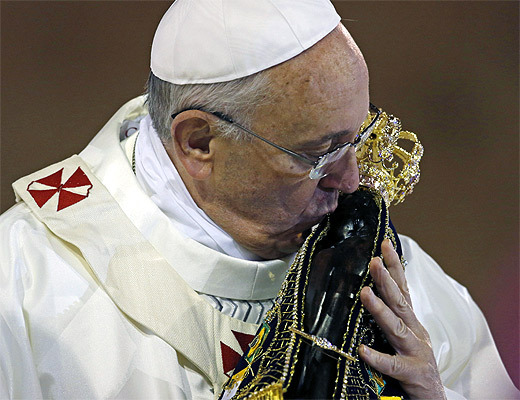 Francis kisses the statue of the Madonna of Aparecida, who Catholics venerate as the patroness of Brazil, in Aparecida do Norte, Sao Paulo State. Priests take part in a mass held by Pope Francis in the Basilica of the Madonna of Aparecida, in Aparecida do Norte, Sao Paulo State. 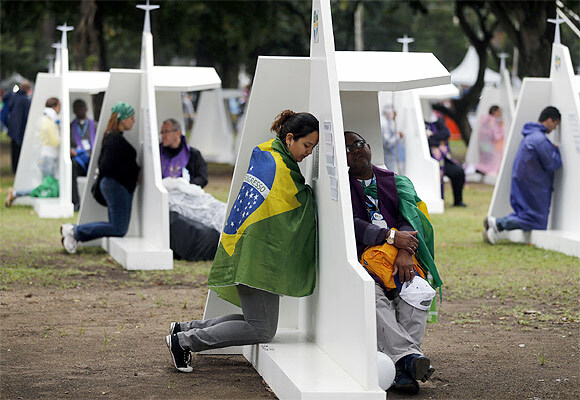 A woman with the Brazilian flag confesses at the confessional booths set up at Quinta da Boa Vista park at the World Youth Day in Rio de Janeiro. Francis embraces a patient at the Hospital Sao Francisco (Saint Francis Hospital) in in Rio de Janeiro. 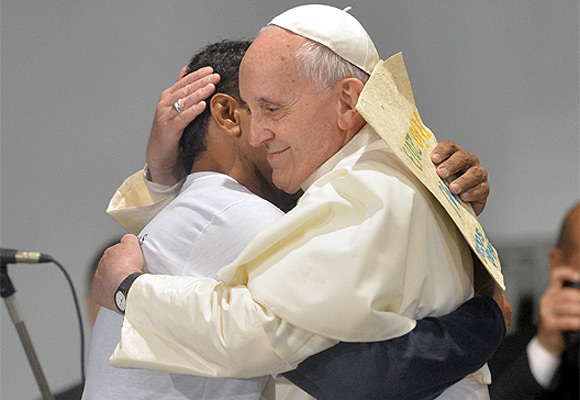 Pope Francis greets residents of the Varginha slum in Rio de Janeiro, in this picture provided by the Rio City Hall. 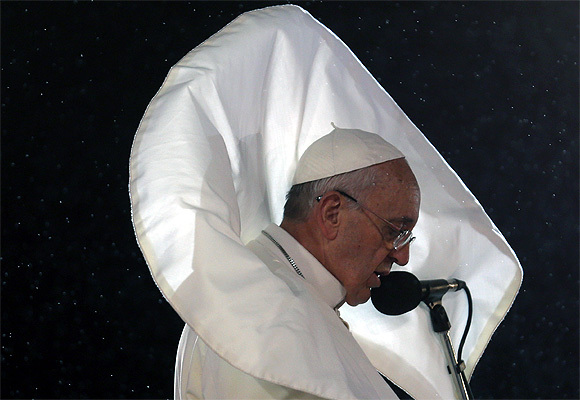 Pope Francis delivers a speech to Catholic faithful at Copacabana beach in Rio de Janeiro. 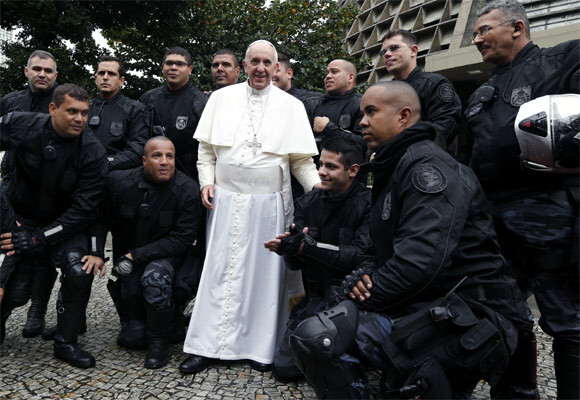 Pope Francis poses for a picture with the Brazilian military police outside the Metropolitan cathedral in Rio de Janeiro. 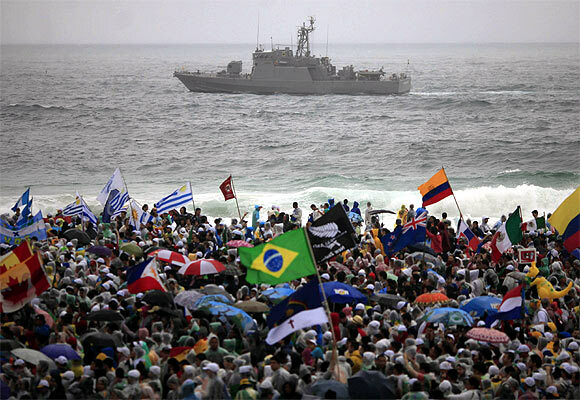 Pilgrims cheer as a Brazilian Navy ship patrols the coast ahead the World Youth Day in Rio de Janeiro. A boy waves a flag along with other faithful as Pope Francis arrives at the shrine of the Madonna of Aparecida, whom Catholics venerate as the patroness of Brazil, in Aparecida do Norte, Sao Paulo State.